After a disastrous showing at the 2004 World Championship and at the World Cup of Hockey, Russia assembled its most talented squad in years, coached by Dynamo Moscow’s Vladimir Krikunov, for the 2005 World Championship. Most teams had above-average rosters due to the NHL lockout. After cruising undefeated through the round-robin games, the team’s real test came in the medal round. Russia survived a 2-0 deficit to beat Finland in a shootout in the quarterfinal. The semifinal against Canada was a dramatic addition to the historic rivalry of the hockey superpowers. Canada was on the verge of handing Russia a devastating embarrassment, leading 4-0 by the first half of the game. 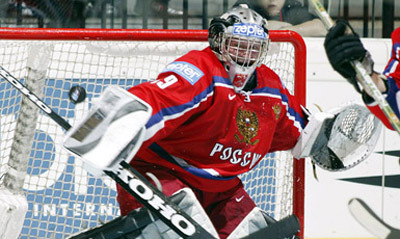 Russia turned the tables to dominate the next half of the game, but Canadian goalie Martin Brodeur kept Russia from making a successful comeback. Having beaten Sweden at the Euro Tour final only weeks before, Russia had no problem handling Sweden again. Alexei Kovalev was selected as the tournament’s best forward. This was only the third World Championship medal for post-Soviet Russia. Despite failing to come in first place, Russia demonstrated that with such a young and talented team it was ready to win many more medals in the next 5-10 years. As well, Russia was the only team to beat the tournament’s champion, Czech Republic.